This kit is designed for children ages 6 to 12 years and has 248 pieces and is compatible with other Lego building block toys at BBB for Kids. Lookout! Gray has become lost n his Gyro sphere and is being chased by a Dilophosaurus. Use the binoculars to seek out the ferocious animal and call for back-up on the walkie-talkie. Help the ACU trooper to rescue Gray in the Jurassic world 4 x 4. Search for the raging dinosaur and call for backup with the walkie-talkie. Stop the dinosaur by using the winch to grab the dinosaur’s legs or by activating the explode function before it can jump on the back of the 4 x 4. Relive the adventures from the movie or create your own adventures using just your imagination. Great building set to add to your LEGO® collect. Click here and order today! Here is a great video from our friends at Artifex Creations on the LEGO® Jurassic World Dilophosaurus Ambush Review : LEGO® #75916. ENJOY! Note: After the movie is released next week we will come back and update this section. Hurry while supplies last! Buy now! This kit is designed for children ages 6 to 12 years and has 174 pieces and is compatible with other Lego building block toys at BBB for Kids. 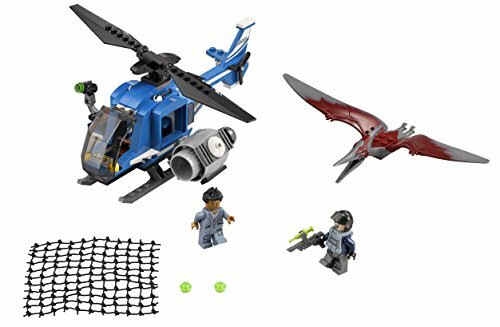 Lego’s Jurassic world Pteranodon Capture Building Kit brings the adventure of a flying dinosaur right into your playroom. A Pteranodon has flown away after seizing an asset containment unit (ACU) in its claws. You need to rush into the cockpit of the cool Jurassic One helicopter, with pilot Simon my Marrani, who is the billionaire backer behind the project. The helicopter has an opening side door to reach the platform and hang out to fire the net shooter. Chase the dinosaur and capture it, with the net shooter, before it can get away. Re-create all the adventure of the movie, or set out on your own adventures limited only by your own creativity. You will have many hours of inventive fund with this building Kit. Check out the current offers Today! Includes 2 mini figures: Simon Masrani and an ACU trooper with a weapon. Jurassic One helicopter features a cockpit for a mini figure, huge rotor, opening side door with a platform, removable stud blaster and a net shooter. Jurassic One helicopter features a cockpit for a mini figure, huge rotor, opening side door with a platform, removable stud blaster and a net shooter; Pteranodon features claws and flapping wings. This building set is designed for children ages 7 to 12 years and has 520 pieces and is compatible with other LEGO® building block toys at BBB for Kids. The Jurassic world T Rex tracker building Kit is the ideal kit for re-creating the recapture of the T Rex, which has escaped. Great building set to add to your LEGO® collect. Click here and order today! You will meet Hoskins for the first time. He is the head of InGen’s Private Security division and race along in the T Rex tracker with an ACU trooper and its harpoon style trap shooter. Your child can also drive the motorcycle that will distract the T Rex while avoiding the creature’s powerful jaws. Meanwhile, make sure they put out the dino-cage as a trap and prepare to fire the mobile research modules trap shooter. You’ve only got one shot to capture this huge dinosaur, so make it count. Create your own adventures and add any parts from your other Lego building sets to make it as exciting as your imagination can conceive. 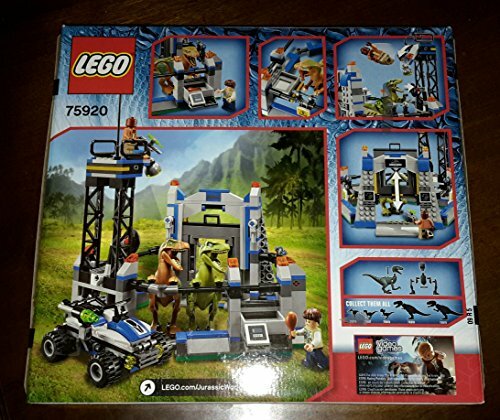 Meet Brick and her partner Brick Titan for LEGO® Jurassic World T Rex Tracker #75918 Build and Review. ENJOY! 3 mini figures: an ACU trooper, Hoskins and a vet. T Rex has moveable arms, legs, neck and snapping jaws. Weapons; the vet’s shock rod and the ACU troopers’ tranquilizer gun. Some were disappointed because they feel the truck in the set was not even in the movie. I guess we will have to wait and see. But other than that the customer was happy. One Raptor has escaped and you need to use the hide speed off road vehicle to capture it and get it back to its pen. Things could not get any worse- the second has caused the vet to fall into its pen. You must rush back to prevent the vet from becoming lunch for hungry dinosaur. . You can fire the flick shooter or use Barry’s tranquilizer gun to tame the Raptor. Have hours of creative fun reliving the adventures of the movie or create your own adventures. This set is compatible with other LEGO® sets so you can build the biggest adventure possible. Check out the special offers! 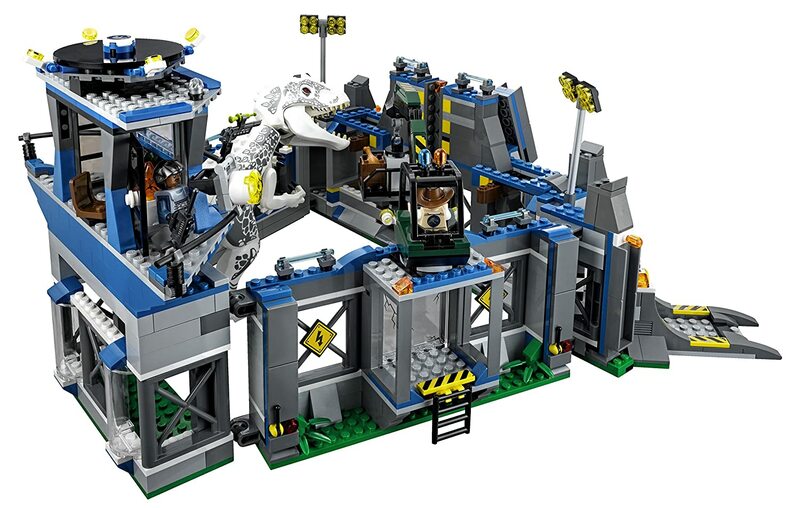 Here is a video review from the Brick Show on LEGO Jurassic World Raptor Escape Item #75920. ENJOY! The Jurassic World Indominus Rex building Kit contains 1156 pieces and is designed for children from 7 to 12 years of age at BBB for Kids. Watch out! The genetically enhanced Indominus Rex is the most dangerous dinosaur in the park and has broken out of the impound. Zack, is in his gyro sphere, launched from the pen wall is now in danger. Direct the hunt for the rampaging beast from the impound research tower. Search for the wild beast using the helicopter and direct it back to the pen before anyone is hurt or any serious damage is caused. Try to avoid the dinosaurs snapping jaws and reaching claws. When the Indominus Rex is in the compound you can feed it with the feeding crane and conduct research in the tower. Your child can also launch the gyro sphere from the impound wall as well as activate the dinosaur pen’s breakout function. Hurry and buy today! Here is a video for the LEGO® Jurassic World™ Indominus Rex Breakout review! Item #75919 from JangBricks. ENJOY!! You can re-create all the exciting adventures from the movie or you can use your imagination to create many different adventures. You can mix this kit with other kits and sets from LEGO® to make many truly exciting experiences. You will have many hours of creative fun with this kit. one customer said, “may be a little pricey, but if you’re a huge fan of the series, you won’t be disappointed”. This set is designed for children ages 6 to 12 years and has 324 pieces and is compatible with other Lego building block toys at BBB for Kids. 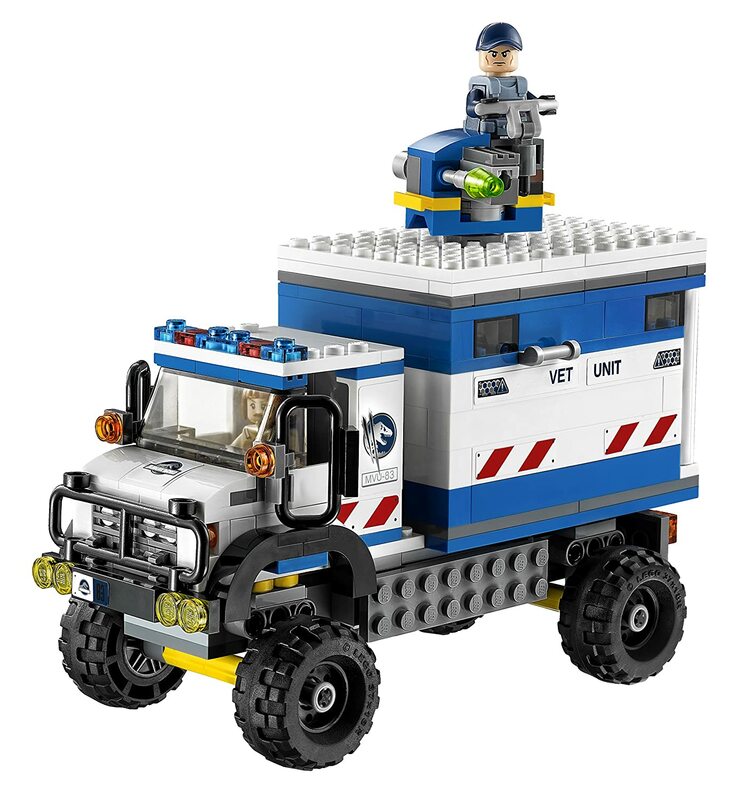 Your child can fend off raptor attacks on the mobile vet unit that is under attack from Blue and Delta, two of the four main raptors (Delta, Blue, Charlie and Echo) in the movie. They can pretend to drive the mobile research unit at top speed and repel the raptors with the rotating rooftop shooter. Click here to get a great price on this TODAY! Owen who works at a behavioral facility on the outskirts of the island and trains and studies these very special Raptor pack will try and distract the dinosaurs by riding his motorbike and holding a flare while you fire the tranquilizer gun to bring down the beasts. Giving the Asset Containment Units, or (ACUs), who are highly-trained professionals a chance to shoot their tranquilizer gun to put the animals to sleep. You can also use your imagination and creativity to create your own thrilling Jurassic world action scenes. Watch this video review from Janbricks because he goes into great detail when reviewing a product. So here is LEGO® Jurassic World Indominus Rex Breakout review! set #75917. ENJOY! The cons are more difficult to assess since this kit is so new. We will now do a series of reviews within LEGO® building blocks for kids. Starting based on age groups LEGO® Duplo and LEGO® Juniors building blocks for kids will be the first one. These sets are designed for smaller children with less developed hand to eye coordination and less grip strength (ages 6 months to 3 years). Here is where parents start opening the possibilities to our children about creativity and imagination. We have watched not only our children but our grandchildren explore the colors and shapes, throw them, eat them and try and mimic us as we stack them. much larger blocks than the usual LEGO® blocks, which are more suitable for smaller hands and to reduce the danger of a choking hazard. All of the blocks are brightly colored to help keep the child’s interest and some are inscribed with numbers to aid in learning numbers and counting. Some sets contain minifigures of boys, girls, police, circus animals, farm animals and a host of whimsical creatures. All of your child’s favorite characters from Disney® movies are included in the various sets. 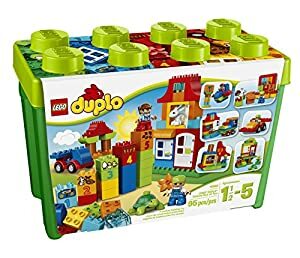 All in all, the LEGO® Duplo sets offer a great choice for your child’s first building experience, teaching them about the outside world while keeping them safe at home. 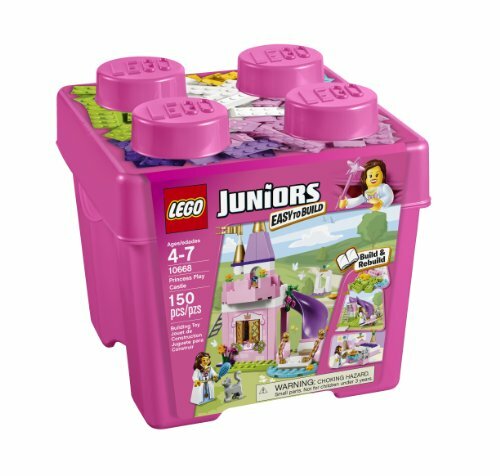 LEGO® Juniors building block sets are the gateway sets to the wider LEGO® world. These are also targeted at younger children (ages 4 to 7 years) both boys and girls. 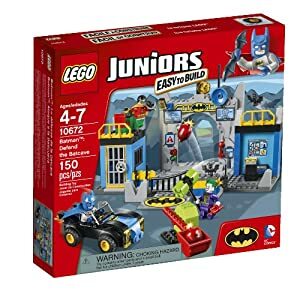 The blocks, mini-figures and other parts in Juniors sets are the same size as in the sets designed for older children. The focus on these sets introduce the child to the Lego product and give them the necessary skills to play with the more complex sets in the future. All of this is accomplished through play. The Junior sets come with very detailed instructions with lots of images so that the child will see each assembly step required. Eventually the child will become confident with his or her skills and begin to tackle more complex sets and free their imagination and creativity. While both these sets are designed with younger children in mind and have different target age groups they serve the same purpose. That purpose is to familiarize the child with the LEGO® system of building block toys, while providing the best play experience possible and give them a means to be creative. Playing at an early age with building blocks, children start to develop grasping, and hand to eye coordination. Children will begin by placing one block upon another and progress to larger and more complex structures as they grow more confident. Learning that a tower of blocks may topple without proper support helps children develop valuable spatial identification skills. Figuring out how pieces of a toy fit together, to build a bridge, a house or a car encourages rational thinking and planning and cooperation with playmates. Playing with construction toys is crucial to a child’s ever-developing cognitive and thinking skills. The improvement of fine motor skill development by the act of reaching for and grasping the blocks and other components. Other advantages are structure making and understanding of forms that work and those that don’t. Also understanding of cause and effect, like the fact that what you build may fall down and why that happened. They also come to realize that most of what they create, as the final product, rarely looks as it was intended in the beginning. Playing with construction sets provides a natural way for children to learn about science and experiment with simple machines, such as inclined planes, pulleys, pendulums, levers and gears and of course gravity. In addition, children who build with building block sets are exploring math concepts such as spatial relationships, shape recognition, comparing and measuring size and length. Teamwork, creativity, perseverance and problem-solving skills can also be enhanced through construction projects when they share the experience. Construction toys, of any kind, have many benefits for young children, in the long run. Building with a variety of components encourages play while learning of early engineering skills (i.e. the bottom block goes first…). However, time and time again we see children improve their socialization by playing and cooperating with other kids in their age group and adults. Children, of all ages, will spend many happy hours, never knowing that they are learning so many things, that they will use, in the rest of their life. While building seemingly random structures they are allowing themselves to occupy time, relax and make noise. This solves a lot of problems for younger kids who have issues because they are inarticulate and have difficulty communicating with others. Building is another way to communicate because kids often talk with themselves, at the toys or to others during play. This video is amazing and shows how this group takes the simple building block and challenges the student to do amazing things. I hope you enjoy it as much as we did. Building block toys teach the child self confidence and trust in their abilities, as well as, the boost it gives creativity and imagination. Kids ( young and old ) will enjoy and benefit for the addition of building blocks to their life. In our next post we will speak of how building blocks help with rehabilitation. building blockscognitive thinking with playCommunity Playconstruction setdevelopmental skillsrobotics. It seems that children have always been playing with building blocks, of one type or another. We did, our parents did, and so did our ancestors. I believe that there is an “inherent” drive to build, whether it is to fulfill our need for creativity and imagination or trying to somehow make things better then they were. Most of us seem to require symmetry and a sense of regularity in our surroundings. This drive can be seen in the smallest child’s play. There is a unmistakable compulsion to stack one thing on top of another, and bind sticks and twigs together to form a more interesting object. Plus the drive to build spans across both boys and girls as well as, the young to seniors. It remains intact! I was wondering how far back does the history really go? What is the real history of the humble building block and how long has it really been around as a toy? To begin to answer this question about when building blocks were first used, it was interesting to find it started out as a ‘learning tool’. I began looking for references for blocks used a as learning tool or anything else. What I found was quite amazing! I found a very interesting article Blocks As a Tool for Learning: Historical and Contemporary Perspectives by Karen Hewitt. In this editorial, Ms Hewitt explains that there are references to toy blocks being used as a learning devices in the writings of Plato (429-347 B.C.). they soon led to alphabet blocks. “Froebel Gifts”, or Fröbelgaben, which included geometric building blocks and pattern activity blocks. He had great insight was to realizing the importance of the activity of the child in learning. He introduced the concept of “free work” and established the “game” as the typical form that life took in childhood, and also the game’s educational worth. In the early years, of the twentieth century, Caroline Pratt developed a variety of wooden shapes she called Unit Blocks, a series of geometrical forms devised on a cohesive scale. Pratt put the unpainted wooden blocks she had made at the center of her teaching, first at a settlement house and then at a private nursery school in New York City. Along with other influential teachers of the time, she embraced the idea that free play with blocks gave children the materials to explore and test their ideas, and to develop an experimental outlook. Witold Rybczynski wrote a book, Looking Around: A Journey Through Architecture . Here he has a specific chapter on Little Architects, Little Architecture pg 183, where he quotes many other authors before his time that all felt the playing with blocks was the beginning to opening up the world of growth and expansion. Building blocks do not need to be expensive, or trendy. They just need to be safe for the child who is using them. When I was a child my dad enjoyed carpentry and my mom was always sewing. As a result I had a never ending supply of toys that were a combination of random sized wooden blocks and old wooden thread spools. Although it was no cost to my parents, they were the best toys I ever had. While I’m not sure that example would work for today’s more sophisticated children. Blocks have been the basis of all learning since the beginning of time and should not be dismissed or replaced by technology without looking at all the benefits. The tradition of ABC Blocks continues to this day. Others have expanded on this old concept of creativity and imagination through “play” from simple blocks- to a whole different array of products for the minds of modern children. This simple toy that I use to find scraps to play with for hours has now many descriptors; building plank (Keva), building blocks (LEGO is the largest manufacturer), or Blocks. They come in different composites; many different wood types (Tinkertoy and Lincoln logs), plastic (LEGO, Megabloks, and Nano Blocks). They can also be motorized (Lego Technic) and some now are robotic (Mindstorm). They are also finding a home in theme based sets of movies and games such as Disney’s Frozen, Star Wars, Lord of the Rings , and video games like Minecraft. The conclusion I have reached, is children have a compulsion to learn. It is our responsibility as parents and teachers to feed that need as early and as often as possible. The alternative is that a child would feel empty or frustrated and would eventually dull the desire to learn in any capacity. So why not have fun watching them develop like we did with all different types of building blocks for our children. This video is a good example of people coming together to help simulate the creative side in a child. I hope you enjoy it! LEGO Classic sets for young and old. Wooden Block sets from Melissa and Doug span the ages. notice that children will play with anything. They will stack random things like boxes, pots, pans, bowls, and anything that they can get their little hands around. This can often lead to disasters. The humble building block helps channels that potentially destructive instinct to a more positive exercise. With the blocks, a child can learn so many things without the direct supervision of adults. However, it is a tremendous experience to both of you if you can set aside playtime with your kids and be amazed at how creative and imaginative they really are. teaching children spatial reasoning, Geometry, vocabulary, hand to eye coordination, imagination and creativity just to name a few. When playing in this way the child learns to grasp different things, and to compare sizes, shapes and colors. As the child experiments, they naturally engage in the scientific method which is also known as trial and error. While becoming more familiar with various shapes, colors, and sizes they begin to better understand the world around them. They learn about organization, measurement and even gravity. Playing with blocks also helps the development of vocabulary because the child will naturally want to tell you what they are making or have made. Social skills also improve as children learn to share and cooperate. Furthermore, in the article, “Playing with Building Blocks of Creativity Help Children with Autism” by Deborah A. Napolitano, Ph.D., BCBA-D., it is stated that: “The study’s findings could pave the way for new studies testing interventions that attempt to improve a wide variety of social skills and behaviors among people with ASD,” said Napolitano. “With positive reinforcement and teaching sessions, such tasks as engaging in novel conversations, posing new questions and creating new ways to play could be within reach for children with ASD.” This study was done entirely with LEGOs building block toys. These Findings, not only offer hope to parents of children with Autism but points the way for all parents to help their children learn and succeed in life. So, if you buy just one toy this year, make it a building block toy. It should be age appropriate but the choices are endless. They range from simple wooden blocks (Tinkertoy, KEVA Planks), and Lincoln Log, or Lego Classic or Lego Education series to specialized block sets up to 5000 plus piece specialized block sets to simple electronics (Technic) and robotic (Mindstorm) toys. They are also finding a home in theme based sets of movies and games such as Disney’s Frozen, Star Wars, Lord of the Rings , and video games like Minecraft. As always we welcome you to subscribe to our mailing list to be updated whenever new posts are added.